After Ludus opens up his shop, Relacion, on Spring 15 or later, you can ask the handyman to construct Farm Circle for your farm. Farm Circles are objects that are either merely decorative, useful, or influential. Most Farm Circles fall into the decorative category, but there are some you interact with to develop your farm, while others can affect other parts of your farm in beneficial ways. To order a Farm Circle, head to Ludus' shop and select Farm Circle Service from his menu options. He can construct a Farm Circle or he can dismantle a Farm Circle that you've already made, which will return half the materials, rounded down, used during its construction back into your supply. For example, a Pet House requires 10 Lumber and 3 Small Lumber to make, but when dismantled you only receive 5 Lumber and 1 Small Lumber in return. You'll unlock new types of Farm Circles by increasing your Town Link Ranks, shipping items produced on your farm, winning seasonal festivals, and even raising your friendship with the local wild animals. Ludus will send you a letter when he has new objects in his Farm Circle inventory. After construction, Ludus will place the Farm Circle into the Fun Time Work Bench on your farm. You can then select the bench to Arrange the Farm or Check your Farm Circle Inventory. You can rearrange the objects on your farm at any time as well as return placed FCs back into your Farm Circle inventory. Any crops that are growing on a field FC will be cleared when you store it, and you can't pack away animal barn FCs that have an animal living in them. Each object will take up space in your farm field grid. Some are small and only take up 1 square of space, while others are large and can take up to 9 squares of space in a 3x3 area. 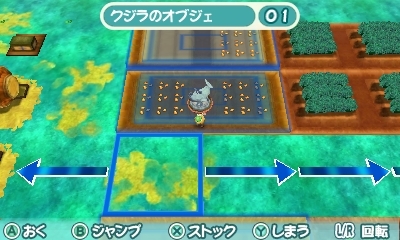 You need to have enough clear space on your farm grid to place the FC, which can easily be determined by looking at the bottom screen of your Nintendo 3DS while you are arranging your farm. All boulders and wild-grown trees will need to be cleared to place a Farm Circle in that spot. If you determine you don't have enough room in an area to place a FC, you can simply walk over to another area of your farm while you are arranging your FCs. While there is a Fun Time Work Bench in each of your farm's three areas, you don't have to exit the Arrangement mode to move to another area. The in-game time is paused while you are working with your Farm Circles and will resume once you press the Y Button to exit customizing your farm. You can only place these objects within your outdoor farm area (not in the basement). 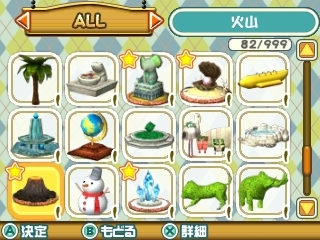 There are no places within the three towns to set Farm Circle objects. When looking at your stock of FCs you might notice a small, yellow star marked on certain objects. The star indicates that the Farm Circle has a special power ability that can affect other FCs placed within its influence area. Ludus doesn't tell you which of his Farm Circles have powers though. You will have to either use an online guide or simply construct them all and see if any of them have the star marker when viewing your FC inventory inside the Fun Time Work Bench. Only 40 of the 266 Farm Circles have special effects. When dealing with FCs that have beneficial effects, the placement and direction of the Farm Circle will determine which neighboring FCs will be influenced. Some starred FCs will radiate their influence in one direction, while others will influence the neighboring FCs that are touching each of its four sides. When viewing your stock of Farm Circles, press the X Button when highlighting a starred FC to see the direction, a summary of the influence, and how many grid spaces the influence spreads out from the Farm Circle. Farm Circles that have influence will spread it along its direction grid line, so try to place affected FCs across (perpendicular) the arrow's direction. As long as the aligned Farm Circle is hit by the blue influence arrow, it will affect the whole Farm Circle. For example, the Scarecrow Family FC will increase the number of harvested crops on field FCs. It has an influence of 2 grid squares directly north and south of where you place it on your farm. If you placed a Soft Field Farm Circle so that it covers both arrows of influence radiating from the Scarecrow Family, then you only get influence on that one Soft Field. But, if you rotate the Soft Field so only one-half of it is hit by the influence, then you have enough room to set a second Soft field that can also be impacted by the Scarecrow Family's power. Rotating and placing various Farm Circles can result in stacking FC effects. After you complete Farming Tips #1 and you have at least one town at Town Link Rank B, Ludus will stop by your house in the morning to explain Farm Circle combinations. On your map screen when you're editing your farm, a new blue-button Combo Icon will be located in the lower-right corner. This button will open the Combo List. This list will display the 13 possible Farm Circle combinations available in the game. Placing certain Farm Circles on the same map area (your farm, west farm, or south farm) will trigger the special combo effect. 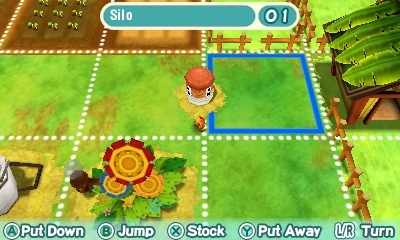 The Farm Circles don't need to be placed next to each other or facing a certain direction; they just need to be in the same area. The Combo List will give you hints as to which Farm Circles are required to trigger the effect as well as the number required if necessary. Typically just one of each type of specified Farm Circle is used, but sometimes you'll see "x2," "x3," or "x4" for when you need to place more Farm Circles of that type. The Farm Circle combo will remain in affect until you remove one of the FCs needed to trigger the combo. Farm Circle names in italics means I am not sure what its English name is yet, sorry!